On Sunday we went out. 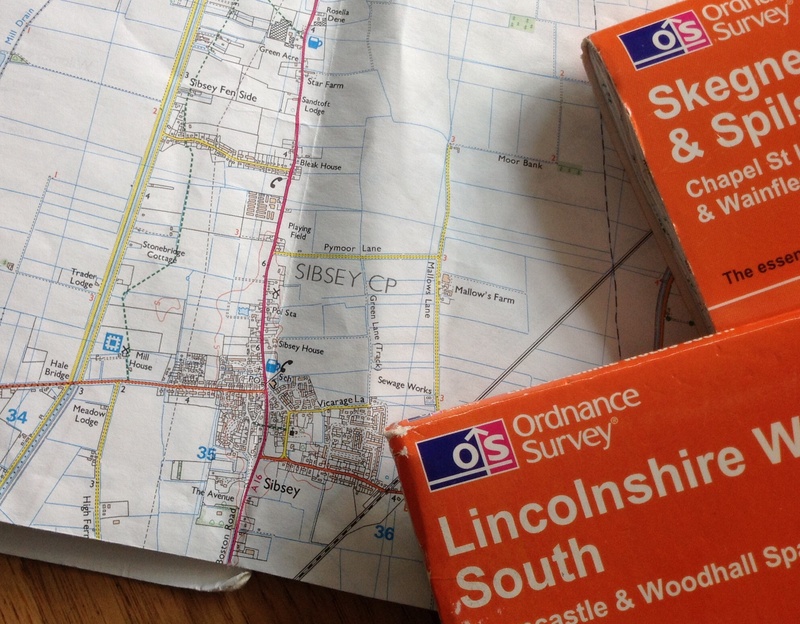 We abandoned the weeding, watering, sowing and digging and instead had a happy series of visits around the Lincolnshire Fens and Wolds. First a brief stop at Sibsey Trader Windmill, one of several working windmills in the area. I love them so much for so many reasons: old technology still working today, locally produced flour, handsome landmarks in this flat country. Our very own Heckington Windmill has been out of action for a couple of years, but the restored sails go back on this summer; I can’t wait. We collected lunchtime sandwiches from the mill tea rooms, then we were off into the Wolds, to the village of Candlesby and a specialist herb nursery. We came away happy, with sage, lemon thyme, rosemary, black peppermint, sorrel and mace. A kind friend brought tarragon, fennel, hyssop, dill and lovage to my birthday last month and so the newly-built herb bed will soon be full. Next stop, Strawberry Fields near Stickford in the fens where owner Pam kindly showed us around the fields of organic vegetables she supplies to retailers all over the country, including the lovely Unicorn Grocery, back where we used to live. So, any Manchester friends reading this, if you buy your veg from Unicorn, chances are you have eaten Strawberry Fields’ produce. On a quiet and sunny Sunday the scene was idyllic: acres of luscious green plants stretching away under a huge sky. A row of scarecrows, looking like workers busy hoeing, were a reminder of the hard slog that goes into growing this good food. Our last visit of the day was in the fens still but with a view of hills, near the village of East Keal where the Wolds begin to rise out of the flatlands. We were meeting some piglets, one of whom we will eat later in the year when she has grown up. 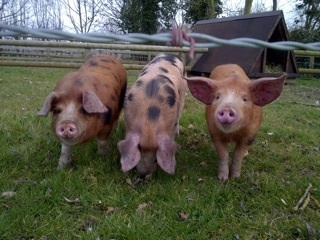 We talked to their owners about pig breeds* and pork and smallholding as we watched the piglets scoffing their dinner. They were cute and fun; and I am going to find it strange eating an animal that I have met in person, as it were. But if I eat meat, I’d rather know that the animals were well looked after while they were alive. And so it goes on, the debate between my vegetarian ‘good angel’ and my demon inner-carnivore. 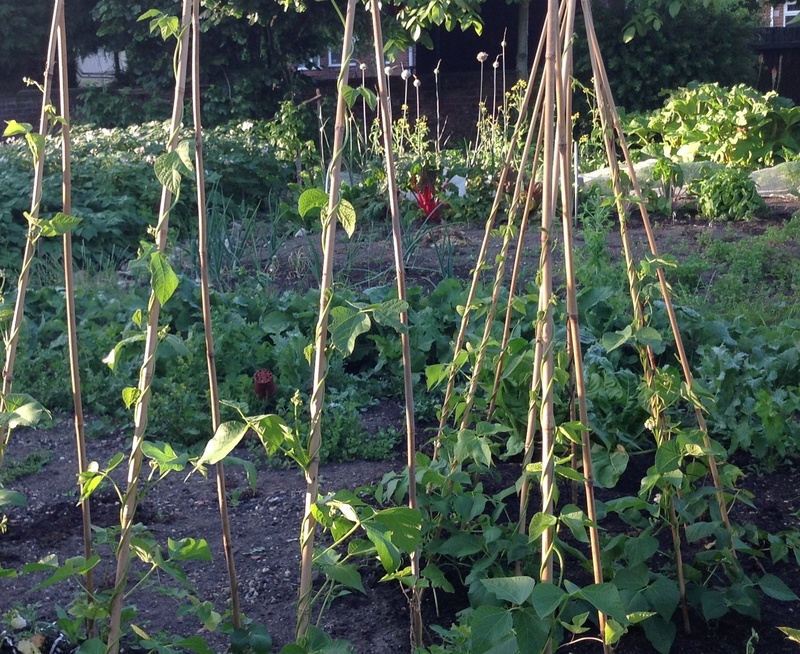 Flour, herbs, lettuces, bacon: and all in the spring sunshine. What a nice day. * These are Oxford Sandy and Blacks. For more info see this Rare Breeds Survival Trust fact sheet. This time last year, when we were leaving, I spent a lot of time looking back over my time in Manchester. I don’t keep a diary, but my nearest thing to one is my cookery notebook, as described in this, my second blog post, Of food, feasts and friendship. The party I talked of there was our last in our Manchester house, but we didn’t do the cooking as we were packing up to move. Friends brought the food, which was nice, but strangely this means that I haven’t written it down in the notebook. I know what we ate at our first Manchester party on 22nd December 1990, but I can’t remember for sure the date of our leaving party in December 2012 (or was it still November?). Recently I have heard of the death of a friend’s mother and a friend’s father, both very striking people in very different ways; and also people I’ve not seen for many, many years. It is only this evening, in another retrospective session with the notebooks, that I find I cooked for both of them in 1981. Is this an odd way to commemorate people? I can’t help but look back, to Manchester and beyond, as the anniversary of our moving approaches. When I was doing the same this time last year- and trying to imagine myself in the new life to come – I said that I wouldn’t miss Manchester the city, but I would miss my friends. And that has turned out to be exactly right. I need a break from grinding all these spices. 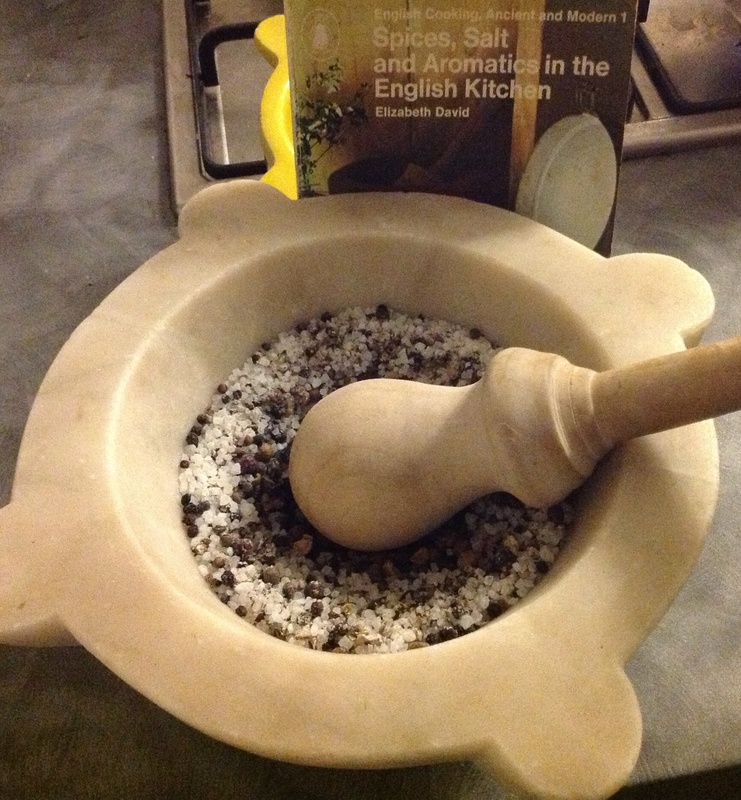 In the mortar are peppercorns, allspice and juniper, along with lots of salt and a little saltpetre or potassium nitrate (the stuff that keeps salted meat pink instead of grey and also makes gunpowder). I am making Spiced Salt Beef for a lunch party at the end of the month (see After the party for its last appearance). The beef has been sitting quietly in brown sugar for two days while we were off gallivanting at a friend’s 60th birthday down south. Now it will sit ten days longer in the salt and spices before I cook it. In Manchester days beef for this dish came from our friends at Savin Hill Farm who come all the way from Cumbria to the Farmers’ Markets in Manchester. Now the beef is from lovely Bassingthorpe Beef. Going to collect it is my favourite sort of journey, through little villages, on winding, muddy, country roads. I bought this mortar, an old chemist’s one, more than thirty years ago when I was still a student, for £12 from a junk shop on Walton Street in Oxford. It was one of the first pieces of cooking equipment I bought for myself and I thought it was cool beyond belief. I still love it. The pestle broke some years ago. This wooden replacement was made for me by a fellow plotholder at Southern Allotments, back in Manchester. I think all he asked in exchange was some eggs from the chickens we used to keep there. I was, and still am very grateful! I also love the Elizabeth David cookery book propped up at the back of the picture (Spices, Salts & Aromatics in the English Kitchen). This copy is the one I had in the year I bought the mortar and pestle; the year when a friend scribbled ‘very excellent good times,’ in the margin, beside the recipe for pork baked with oranges. Not all my student days were good, but times in that year, that house, cooking and sharing food with friends, yes, excellent they were indeed. I am at the kitchen window, looking out on the garden as I tear the fat stalks from a glossy sinkful of chard leaves. Baby carrots and cavalo navone (a buttery Italian turnip, highly recommended) are stewing with oil and honey. Steam from the new potatoes rattles the saucepan lid and makes me think of James Watt watching his mother’s kettle and inventing the steam engine. 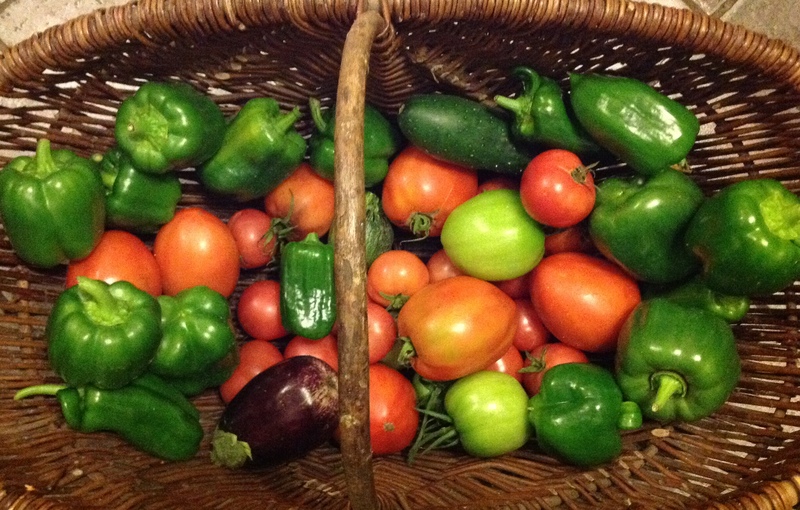 For the first time most of this evening’s meal comes from the garden. It’s been thin pickings from this new plot compared to recent years when by July we would have been feasting on allotment produce. My mouth waters in anticipation of the earthy taste of chard and sweet carrots. I love eating things so soon after they come out of the ground or off the plant. And as I stand there, something flips me back to a much younger self. It’s London in the early 80s and there I am, head over heels in love with the markets like Pimlico’s Warwick Way and Soho’s Berwick Street. 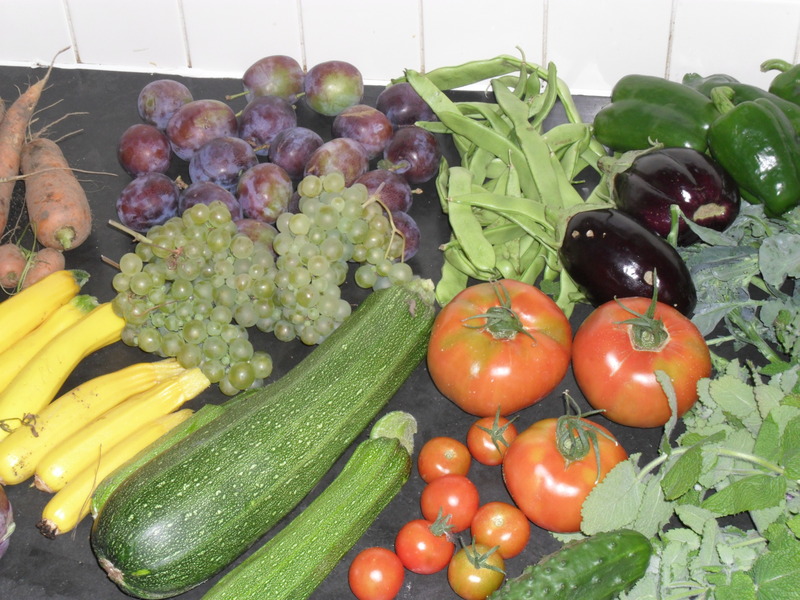 I smile a little ruefully at my smugness in knowing the good places to buy food; but it’s nice to remember that child-like pride and pleasure in negotiating the stalls and heaps of produce, coming home with just what I wanted, lovely fresh things crying out to be cooked. Back then the idea of growing anything other than a few herbs in pots never crossed my mind. I’ve got to know a different way of living, but colours, textures, tastes, the excitement of food are all the same. And at 53, with my hands in a sink full of green leaves, inside I feel just like myself at 23. Friends from Manchester will remember that we used to buy our meat from the farmers’ markets in Piccadilly and Chorlton, most of it from brilliant Savin Hill Farm in the Lyth Valley in Cumbria. Other favourites were Mrs Kirkham’s Lancashire at Piccadilly and Winter Tarn Organic Farm at Chorlton Green. We miss them, but are happy to have another farmers’ market on the doorstep – once a month at Sleaford, the town five miles away from Heckington. The above photos are of stalls I visited there this morning. This being a farming area, the stallholders are almost all from Lincolnshire; producers at the Manchester market travel from as far as the north of Cumbria. Talking to farmers reminds me just how hard they work to produce food for the rest of us to eat. Mount Pleasant Windmill (see first picture) is one of several working windmills in the county – along with our own local one (Heckington Windmill); I think they are brilliant, amazing things to have around us here. Not surprisingly, I heard several jokes today about ‘only beef here.’ No one selling horse though; ostrich, but not horse.